Looking for access to Android’s native AlarmManager in your Titanium project? Using the new benCoding.AlarmManager you can now schedule alarms and services easily. You can download the compile module here. Before getting started please take a look at the “Before You Start” section in the documentation and download the full example project located here. The source is available in the benCoding.AlarmManager repo on GitHub. Take a look at the full example project located here before starting. The AlarmManager module provides an API for create AlarmManager alerts. 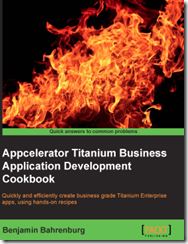 The module also provides methods that allow you to schedule your Titanium Android Services to be launched. This is an easy method for scheduling code execution even when your app isn’t active. The addAlarmNotification allows you to schedule an Alarm that will then create an notification. minute– (Required) The minute of the start time. playSound(Optional) Play the default notification sound when alarm triggered. vibrate(Optional) Vibrate the device on notification. Please note this requires the vibrate permission. showLights(Optional) Activate notification lights on device when alarm triggered. repeat – (Optional) Used to schedule a repeating alarm. You can provide a millisecond value or use the words hourly, daily, monthly, yearly. Please note if you omit the day, month, and year parameters the module will assume you mean to make the alarm effective from today and add the number of minutes provided. You can also provide a millisecond value to schedule your own repeat frequency. The addAlarmService allows you to schedule an Alarm that will run a service within your Titanium App. Before using this method you will need to define a service and re-compile your project. After recompiling your project open your /build/AndroidManifest.xml to file your full service name. This is important as Titanium generates this name. To learn more about Android Services please read the documentation here. service– (Required) The full service name from your AndroidManifest.xml to be run. interval– (Optional) The value used to create an interval service. This value must be in milliseconds. forceRestart– (Optional) Force the service to restart if it is already running. This method cancels all alarms submitted using the addAlarmNotification method. Unfortunately if you want to cancel only one alarm you need to cancel them all and re-submit. This is due to how Android handles pendingIntents. This method cancels all alarms submitted using the addAlarmService method. Unfortunately if you want to cancel only one alarm you need to cancel them all and re-submit. This is due to how Android handles pendingIntents. Android Alarm’s work using BroadcastReceivers. In order to have your Titanium project subscribe to the Alarms it generates you need to add the receivers into your tiapp.xml file. The benCoding.AlarmManager uses two receivers. One for each kind of Alarm you can schedule. See below for the example. Full documentation is available here, additionally there is a fully functional sample project available for download here. Please note the same project is not included in your module zip file. Since the AlarmManager module requires the setup of BroadcastReceivers and specific service names I would recommend taking a look at the example app.js before starting. Please find below a code snippet from the example project showing how to use a few of the methods. repeat:60000 //You can use the words hourly,daily,weekly,monthly,yearly or you can provide milliseconds. repeat:'daily' //You can use the words hourly,daily,weekly,monthly,yearly or you can provide milliseconds.